Generics and Biosimilars Initiative Journal (GaBI Journal). 2018;7(2):84-91. Biosimilar drugs have suffered slow entrance and acceptance rates in the US market, due not only to common misperceptions among the public but also US Food and Drug Administration (FDA) licensing laws. This review offers nine major recommendations for the FDA to simplify how biosimilars are licensed and thus make biosimilars more accessible to American citizens. H.R. 3590 Sec. 7002 , commonly known as the Biologics Price Competition and Innovation Act (BPCI Act), a part of the Affordable Healthcare Act, was enacted in 2009 to introduce biosimilars (copies of biological products coming off patent) to the market. Since then, the US Food and Drug Administration (FDA) has licensed 11 products (as of June 2018) , comprised of eight molecules: adalimumab, bevacizumab, epoetin, etanercept, filgrastim, infliximab, pegfilgrastim and rituximab. Under the New Drug Application (NDA) filing, insulin glargine products (Lusduna  and Basaglar ) have also been approved by FDA and from March 2020 all insulin products can be approved as biosimilars . FDA has issued several draft and final guidelines to industry on demonstrating biosimilarity , which is the primary determinant for licensing a product, either as a biosimilar or an interchangeable biosimilar. Interchangeable biosimilars are… a separate category of biosimilar products that are additionally tested to demonstrate that automatic substitution of an originator product with the ‘interchangeable biosimilar product’ will not result in reduced efficacy or increased side effects. The slow entrance and acceptance of biosimilars in the US is the result of high costs and long development times – nearly US$250 million and almost eight years  – as well as a gross misunderstanding of the safety of biosimilars among prescribers and the public, principally due to ideas put forward by the products’ originator companies. While FDA has recently launched a campaign to educate stakeholders regarding the safety of biosimilars , much work remains to be done in order to simplify and expedite licensing of biosimilars, as emphasized by the author in several publications and a recent citizen petition to FDA [9–11]. The suggestions made in this paper come from decades of experience in developing biosimilar products globally, including through the biosimilars (351(k)) and NDA pathways (505(b)(2)). (ii) Determination by Secretary. —The Secretary may determine, in the Secretary’s discretion, that an element described in clause (i)(I) is unnecessary in an application submitted under this subsection. The statutory requirements provided in section k.2.A.i.I form the basis of biosimilar development. Remarkably, these requirements are left to the discretion of FDA, as shown in k.2.A.ii, leaving only section k.2.A.i.I–V as unchangeable by FDA . Interchangeable licensing has additional legislation, as shown in k.4.A–B. A biosimilar product must demonstrate the same clinical results as the reference product, which can only be shown by patient testing. Studies using a switching-and-alternating protocol, where an originator biological product is switched with a biosimilar product and then back to the originator product, must show no diminished efficacy and no greater risk when compared to the reference product without alteration or switching. This legislation prevents FDA from making any changes to the requirements for interchangeable biosimilars; thus this paper will address issues related to the approval of biosimilars only. Modify the current requirement for bridging studies between a US-licensed product and a non-US approved comparator, provided the non-US product meets certain specifications, such as same indications, same dosage form and approved using essentially the same dossier as the US-reference product, to establish biosimilarity. Present clear scientific evidence to the public and, more particularly, prescribers that a biosimilar product has no ‘clinically meaningful difference’ from the originator product and thus should be acceptable for naïve patients, without involving the legality of substitution issue. Encourage the development of in vitro immunogenicity testing methods to reduce exposure to test subjects, which would have ethical advantages and allow comparison of multiple batches of the biosimilar candidate product, improving safety evaluation. Replace the current arbitrary comparisons of critical quality attributes, such as protein content or variations in known impurity profiles with clinically-relevant limits and ranges in testing analytical similarity, animal toxicology, pharmacokinetic/pharmacodynamic (PK/PD) immunogenicity, and other safety and efficacy attributes. Minimize clinical studies by combining studies intended to establish immunogenicity, efficacy and PK/PD profiles to avoid unnecessary testing on patients. Clarify policy on analytical method validation. Change the requirement for the use of commercial-scale batches for determination of biosimilarity. These recommendations are also, in part, the subject of a citizen petition filed by the author to FDA . Developing biosimilars is costly and requires developers to formulate a global strategy where one regulatory dossier can be used to secure regulatory approvals in multiple jurisdictions. Since the BPCI Act requires that a biosimilar be similar to its locally licensed originator (that is, a product approved under Sect. 351(a) of the Public Health Service Act of 1942, as amended) , developers are not permitted to use a non-US product as a reference product. As a result, creating a global dossier requires three-way studies, i.e. a US-licensed product, a non-US product, and the biosimilar candidate. 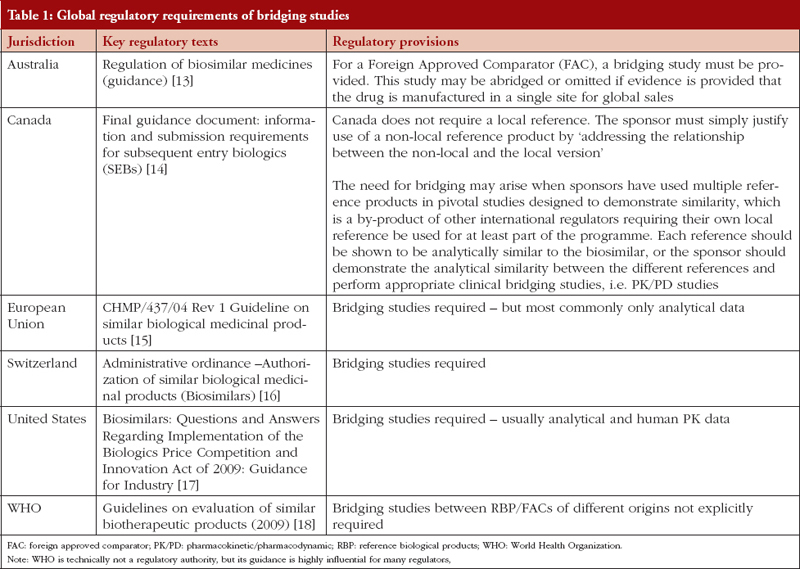 To reduce the burden of additional studies, and to reduce unnecessary exposure to humans, several regulatory authorities have established clear policies on bridging studies , as shown in Table 1. The non-US reference product was judged to be equivalent to the US-licensed product in any regulatory filing that presented a bridging study, such as the recent approvals of infliximab  and bevacizumab . FDA Commissioner Dr Scott Gottlieb agrees with the suggestions made above, however, there is wider FDA concern that legislative action would be required to make changes to current practice . The author finds no legal reason why this change cannot be made by FDA. The BPCI Act creates two categories of biosimilar products: biosimilar and interchangeable biosimilar. The latter classification was intended to allow the automatic substitution of an originator product with a biosimilar product. The labelling of an interchangeable biosimilar requires in patient studies to demonstrate similar efficacy. When a biosimilar product is repeatedly administered, the two products (biosimilar and reference) are alternated to establish that there is no reduction in efficacy or increase in side effects caused by the biosimilar. As a result of the complexity of these studies making them extremely expensive to conduct, developers have been reluctant to file for interchangeable status; and FDA is yet to approve a product as an interchangeable biosimilar. However, there is a need for a strategic approach to allow the substitution of biosimilars based on how FDA characterizes a biosimilar. ‘A biosimilar is a biological product that is highly similar to and has no clinically meaningful differences from an existing the FDA-approved reference product ’. From a scientific and clinical viewpoint, if a product is clinically equivalent, there is no reason why it should not be prescribed to naïve patients. This view is shared by FDA Commissioner Dr Scott Gottlieb who stated that ‘payors can also lead the way in formulary design by making biosimilars the default option for newly diagnosed patients. They can share the savings with patients, maybe by waiving co-insurance ’. Declare the official position that a licensed biosimilar product has no clinically meaningful difference and that it can be substituted for the originator product when the originator product is prescribed for a naïve patient. Educate prescribers that biosimilars are safe and equally effective, with no risk of additional immunogenicity when used in naïve patients—the most significant barrier to the entry of biosimilars into the US market. Motivate and enforce the adoption of biosimilars by payers and make the pricing structure more transparent in order to demonstrate cost savings to patients and prescribers. Immunogenicity, as stated in FDA guidelines on biological drugs, must be assessed in the target population since animal testing and in vitro models cannot predict immune response in humans . Immunogenicity also has a role in demonstrating product comparability following manufacturing changes. Even minor changes can potentially affect the bioactivity, efficacy or safety of a biological drug. As a result, FDA is making important advances in predicting immunogenicity , in particular promoting the use of in vitro immunogenicity assays. ‘… ongoing consideration should be given to the use of emerging technologies (novel in silico, in vitro and in vivo models), which might be used as tools during development or for the first estimation of risk for clinical immunogenicity. In vitro assays based on innate and adaptive immune cells could be helpful in revealing cell-mediated responses ’. The characterization and screening of biosimilars for physicochemical determinants or formulation-based factors aid both in the prediction of immunogenicity and in the development of less immunogenic therapeutic agents, considering impurities, heterogeneity, aggregate formation, oxidation and deamidation of the molecule. Moreover, predicting potential immunogenic epitopes in therapeutic biologicals is an important and useful strategy to improve their safety. Immunogenicity testing however substantially increases the cost and time requirements for drug development and the goal of regulatory guidance should be to minimize human testing where possible. 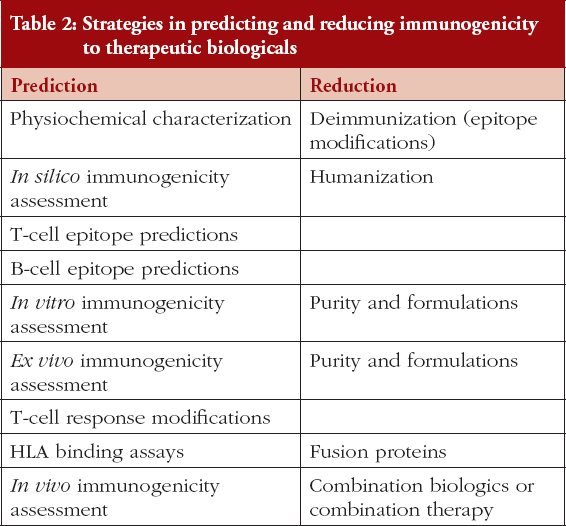 A variety of preclinical immunogenicity assessment strategies are currently used during biological development, as listed in Table 2. A major advantage of in vitro methods is the ability to test multiple batches for immunogenicity, which is not possible in human subjects. In vitro tests can also be more useful in predicting the difference between a biosimilar product and its reference product. Allow developers to present in vitro, in silico, or novel in vivo test methods and thus request a waiver from clinical immunogenicity testing. Continue internal development efforts to find and prescribe testing modalities that reduce the need for clinical testing of immunogenicity. Bioequivalence is defined in 21 CFR 320.1 (Hatch-Waxman Act)  as ‘the absence of a significant difference in the rate and extent to which the active ingredient or active moiety in pharmaceutical equivalents or pharmaceutical alternatives become available at the site of drug action when administered at the same molar dose under similar conditions in an appropriately designed study’. Since the site of action is not known in most cases and rarely available for sampling, level in blood was selected as a surrogate to the site of action. The PK profile characterizes two stages, absorption and disposition (distribution and elimination), making it most relevant to generic chemical (small molecule) drugs where disposition is less likely to vary. This makes the PK profile relevant to absorption, and therefore bioavailability, thus providing validation of bioequivalence. The PK profiling of biosimilars follows the same testing protocols as used for generic drugs. However, extrapolation of testing protocols involves a significant misconception – biosimilar drugs are administered parentally, which means that while differences in absorption are unlikely, differences in disposition are likely (distribution may change due to binding effects for example, and elimination may change due to subtle structural differences). This difference between generics and biosimilars should be addressed in the selection of PK parameters and statistical models applied to demonstrate similarity. When FDA developed guidance on biosimilars, the term ‘clinical relevance’ was introduced, which is the most crucial aspect of determining biosimilarity and addresses the step-by-step approach  of demonstrating: analytical similarity, non-clinical toxicology, PK/PD profile, immunogenicity profile and, if there remains any ‘residual uncertainty’, performing additional clinical studies in healthy subjects. Consideration of ‘clinical relevance’ should therefore also be part of PK/PD analysis. Waive PK studies where the product is administered by a route (ocular, otic, and possibly others) that does not provide sufficient concentration of the active moiety in blood, such as the intraocular administration of ranibizumab . However, to allow evaluation of disposition kinetics, PK studies involving intravenous administration in an appropriate animal, such as monkeys, should be required for monoclonal antibodies. This could be integrated into the non-clinical toxicology assessment. In most instances, a study population of 10–12 animals should suffice. When administered parentally, as most biosimilars are, PK parameters relating to distribution such as distribution volume and parameters relating to elimination such as terminal half-life are more clinically relevant than the area under the curve (AUC) or peak plasma concentration (Cmax). Statistical modelling should include these additional parameters. Distribution volume was introduced as a determinant of clinical efficacy by the author decades ago and finds a new application in the evaluation of biosimilars . While a confidence interval within 80–125% for the log ratio of Cmax and AUC (and for any other parameters added, as suggested above) has performed well as an acceptance criterion for generic drugs, there is no assurance that these intervals are clinically meaningful for biological drugs. Whether FDA should broaden or narrow the interval of acceptance remains to be determined once the additional parameters suggested above are taken into consideration. Encourage the use of scaled average bioequivalence (SABE) testing protocols that allow collection of immunogenicity profiles in a single study. In those instances where the immunogenicity data are required from a patient population, allow PK/PD profiling in patients, reducing the number of clinical studies required. Allow PK/PD studies to select a population that is likely to have minimal variation to reduce study sizes. Choosing such populations would help to demonstrate differences between the biosimilar candidate and the reference product. FDA has recently released draft guidance on ‘Statistical Approxaches to Evaluate Analytical Similarity’ for biosimilars , one of the most critical components for establishing biosimilarity and a component that determines which additional studies, both clinical and CMC-related, are required. A developer identifies critical quality attributes (CQAs) and tests them using Tier 1, Tier 2, or Tier 3 statistical methods, depending on the nature of data output and the importance of the attribute to the safety and efficacy of a biosimilar product. For CQAs in Tier 1, equivalence is established by rejecting the interval (null) hypothesis: −1.5 σR ≤ 90% CI of [μT–μR] ≤ 1.5 σ, where μT and μR are the mean responses of the test (the proposed biosimilar product and the reference product lots, respectively). This statistical testing suggests the equivalence acceptance criterion (EAC) = 1.5 × σ, where σ is the variability of the reference product (standard deviation). Statistical justification for the factor of 1.5  follows the idea of the SABE criterion for highly variable generic drug products proposed by FDA. To achieve the desired power for the similarity test, FDA further recommends that an appropriate sample size is selected by evaluating the power using the alternative hypothesis μT − μR = ⅛. There is no relevance of the factor of 1.5 used in equivalence testing of the most critical CQAs. For example, in the briefing on approval of Sandoz’s filgrastim product , FDA stated that one of the CQAs (protein content) initially failed, requiring additional batches to be added to the analyses. While there is a correlation between dose and effect for biological products, a small variation – as observed in the Sandoz data – should not have any clinically meaningful effect, since the release specification provides considerable variability. In essence, a test for analytical similarity may fail, yet such variation is allowed in the commercial product. Exclude any quality attributes for testing of analytical similarity that are part of the COA. If FDA accepts the variability as shown in the ranges of acceptance provided in the COA, it is illogical to accept or reject a product based on statistical limits of analytical similarity. The COA is clinically relevant, while the tiered testing of these attributes is not. Critical quality attributes of importance are primary, secondary and tertiary structures, receptor binding and impurity profile of timed samples, in addition to many more that are pertinent to differences in the molecules, albeit subtle. Allow developers to identify the CQAs and their range of variability based on clinical meaningfulness rather than using a factor of 1.5 arbitrarily to establish equivalence in a Tier 2 testing. If a product fails a Tier 1 test but passes Tier 2 testing, allow this as acceptance of similarity. It is clearly understood that all analytical methods, including bioanalytical methods, must be validated, as provided in a May 2018 final guidance on bioanalytical methods . However, analytical similarity testing requires methods that are often difficult or impossible to validate based on the guidance provided without incurring high cost and time commitments, such as nuclear magnetic resonance techniques or mass spectrometry. While all analytical methods used in the authorization of a biosimilar should be validated, methods used to demonstrate other analytical attributes may be accepted by FDA if they are ‘suitable’, a term often used in FDA guidance but not clearly defined. There is a need for FDA to clearly differentiate between the methods that must be validated and the ones that can be used if found suitable. Current approaches to evaluating the differences between a biosimilar candidate and a reference product are based on methods for characterizing new molecules; there is a need to develop more sensitive techniques to determine differences in the structure of large molecules, both at steady state and while active within the body. Several new techniques have recently come into practice, including modified capillary electrophoresis, Chip-based (Bioanalyzer) Protein Electrophoresis Assays (CPEA), and many variations of mass spectrometry . ‘the results of integrated, multi-parameter approaches that are extremely sensitive in identifying analytical differences (i.e. fingerprint-like analyses) permit a very high level of confidence in the analytical similarity of the proposed biosimilar product and the reference product, and it would be appropriate for the sponsor to use a more targeted and selective approach to conducting animal and/or clinical studies to resolve residual uncertainty and to support a demonstration of biosimilarity ’. The introduction of new methodologies could help to demonstrate clinically meaningful similarity between products that will reduce the number of additional studies required [36, 37]. Unlike the development of entirely novel drugs, the development of biosimilars requires commercial-scale batches in order to begin testing for similarity. The rationale for this requirement derives from the assumption that there may not be any in patient or ‘phase III’ studies required that are historically conducted using commercial-scale batches. This requirement generates a huge cost and time burden, preventing smaller developers from entering the market. While FDA has not identified what it considers to be ‘commercial scale’, these issues were highlighted in a Type 2 formal meeting between FDA and sponsors of Biosimilar User Fee Act (BsUFA) products . The author suggests that FDA requires a batch size that is adequate to provide samples for stability, clinical or other required testing, instead of making market projections to justify the size of a commercial batch. Should the developer decide to change the batch size after the product has been approved, the developer may use the Comparability Protocol for Biological Drugs  to make this post-approval change. This clarification by FDA would have a significant impact on industry, allowing smaller developers to offer market-ready products using smaller batches and at much lower cost. If it is determined a priori that studies are required in patients, allow developers to conduct PK/PD profiling in patients as well. Allow statistical models of PK/PD studies to determine immunogenicity within the same study. Allow the use of in vitro models for immunogenicity testing to reduce human exposure. Allow the use of animal models to establish differences in the PK (and, where possible, the PD) profile where blood concentrations are not measurable. Remove the default requirement of conducting bridging studies for non-US reference products, where the reference product meets specific criteria. Declare that biosimilars have no clinically meaningful difference from the originator product and, therefore, substitutions for naïve patients should be allowed. Remove the default requirement of conducting in vivo immunogenicity testing and allow developers to offer alternative in vitro and in silico testing methods. Modify PK/PD protocols and statistical analysis methods to make the outcomes clinically meaningful. Modify testing of critical quality attributes by separating them from release specifications to demonstrate analytical similarity. Minimize clinical testing by combining studies. Clarify the type of validation required for analytical similarity testing. Allow the approval of products based on smaller scale studies. FDA recognizes the need for changes to its guidance. Commissioner Dr Scott Gottlieb  has recently expressed a willingness to respond to the urgent need to reinterpret guidelines for the increased approval and adoption of biosimilars. In June 2018, the FDA withdrew its guidance for Analytical Similarity Testing  and a few days later FDA announced a new initiative, Biosimilars Action Plan that includes most of the recommendations made by the author in its citizen petition . This paper represents solely the views of the author and should not be understood or quoted as being made on behalf of or reflecting the position of any regulatory authority or company. Competing interests: The author of the paper declared that he is a developer of biosimilar products. The author is founder of Karyo Biologics, LLC and Adello Biologics, which have several biosimilar products at various stages of FDA approval. 7. Blackstone Erwin A, Fuhr Joseph P, Jr. The economics of biosimilars. Am Health Drug Benefits. 2013;6(8):469-78. 9. Niazi S. Obstacles to success for biosimilars in the US market. European Pharmaceutical Review. 2018 Jan 4. 10. Niazi S. eBook: Challenges facing biosimilar entries into US markets. 2018 Jan 16. 11. Niazi S. Citizen Petition from UIC College of Pharmacy. ID: FDA-2018-P-1876-0001. 12. Webester CJ, Woollett GR. A ‘Global reference’ Comparator for biosimilar development. BioDrugs. 2017;31(4):279-86. 29. Niazi S. Volume of distribution as a function of time. J Pharm Sci. 1976;65(3):452-4. 31. Chow SC, Song F, Bai H. Analytical similarity assessment in biosimilar studies. AAPS J. 2016;18(3):670-7. 36. Niazi SK. Method for comparing structure of one biomolecule with second biomolecule. United States Pub. No. 2018/0024137 A1. 2018 Jan 25. 37. Niazi SK. Single-use bioreactors and mixing vessels. United States patent 9,469.426 B2. 2016 Oct 18.